Mix the first 8 ingredients together in a large bowl-- these are your wet ingredients. Mix the next two dry ingredients in a small bowl. 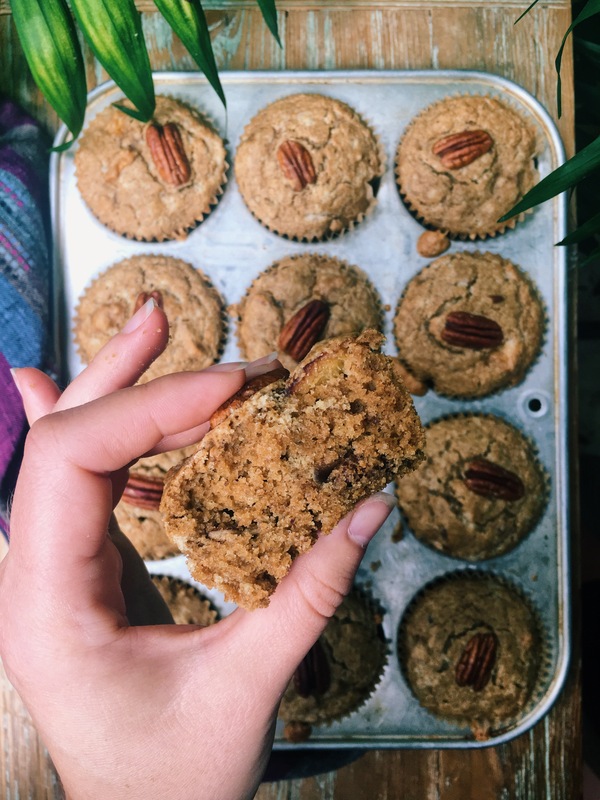 *The reason I needed to add nutmilk to this muffin recipe is because the oat flour absorbs more liquid. If you are using regular flour, add nutmilk in a little bit at a time. You may find you need less than 1/2 Cup! Add the dry ingredients into the wet ingredients. Once incorporated, fold in the pecans. Spoon the batter into your muffin tin liners and place a Pecan half in top of each one. Bake for 23 minutes, let rest for 10, then enjoy!